View of Pueblo Bonito ruins from the cliff above. February 21 – February 22, 2017. It’s 5,400 BCE. Most of the Earth’s continents have human inhabitants. These people use tools. They use genetic modification of plant and animal species to make their lives easier. They study the patterns of the stars. One star, ten times as large as our sun, has lived its life. It goes supernova. But it’s 6,500 light years from Earth. None of the sky-watching cultures down here will notice the difference for a long time. 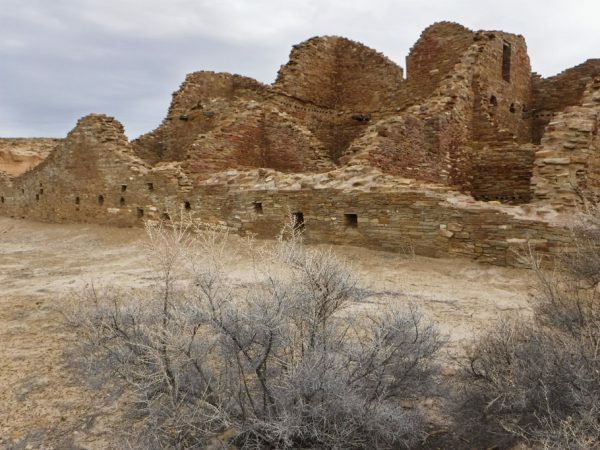 We went to Chaco Canyon in New Mexico last winter. It’s not an easy place to visit. There are not many facilities nearby. We took the easiest entrance. 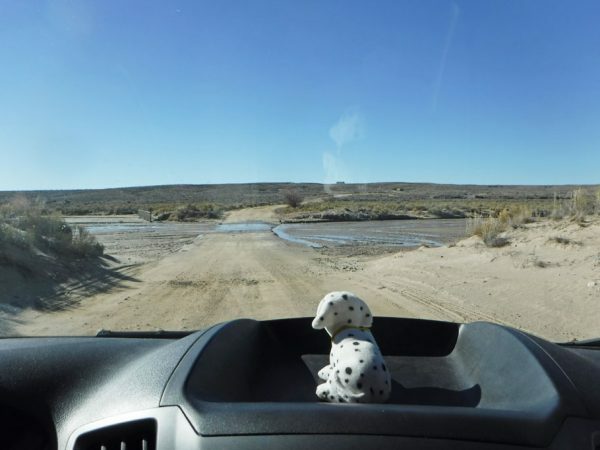 The last leg was 16 miles of unpaved road. We started in as early as we could. If the campground were full, we’d have to leave and find somewhere else to stay. No problem. There were plenty of sites available. Many southwestern tribes believe their ancestors used this place. They consider it sacred, and do not want it to be as accessible as the popular national parks. Some of the old ceremonies are still practiced here. 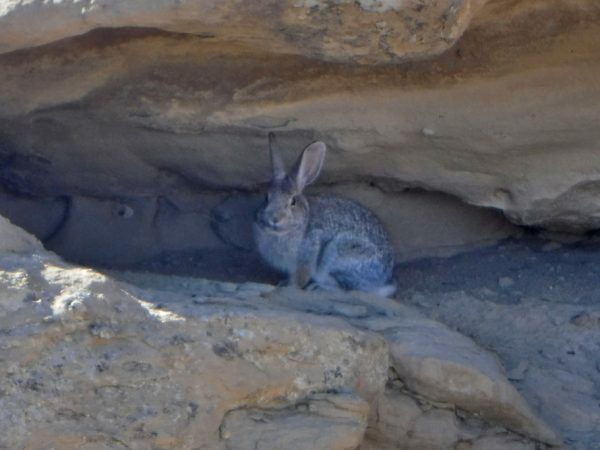 The oral traditions surrounding Chaco are also guarded closely. It’s a place of mystery. 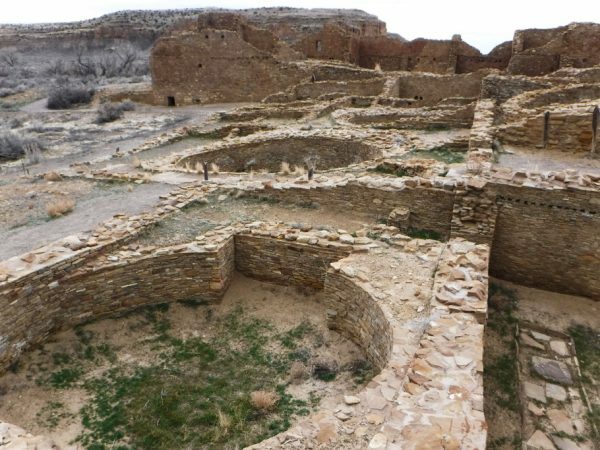 The canyon was at the center of a complex of great houses that were located as far away as Arizona and Colorado. The National Park, which is also a World Heritage Site, contains the remains of 13 of those great houses. 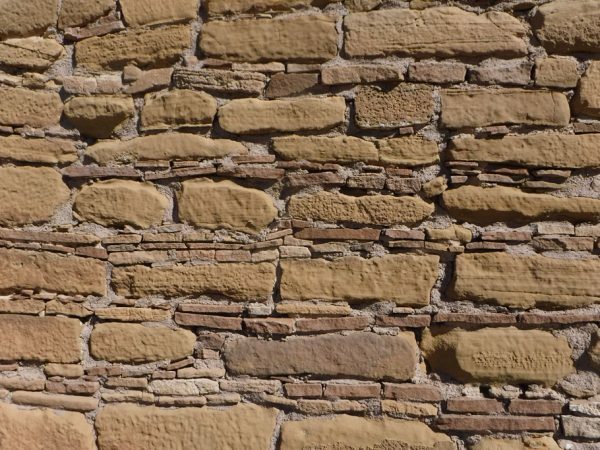 All were built between 850 CE and 1150 CE. Then they were left, and the desert moved back in. Some have been excavated over the years. The great houses were planned multi-story structures with large courtyards, hundreds of rooms, and many ceremonial kivas. Structures and doorways are aligned to recognize celestial events. A network of roads led here. The complex housed between 2,000 and 6,000 permanent residents, and served many thousands more visitors. It is a testament to the engineering and organizational skills of a very intelligent and capable group of people. And what do we know about these people? They came from many different tribes and spoke different languages. They traded goods from as far away as central Mexico. They were part of a centuries-long transition from hunter-gatherers to farmers to city dwellers. But, unfortunately for us, they didn’t have a tradition of writing things down. Also, widespread looting of artifacts has obscured the history of this place. So we are left with many questions. Why do the approaching roads go straight over obstacles they could skirt around? How were the great houses managed? What kinds of ceremonies happened here? Why do some chambers look as though they were set ablaze then closed up? 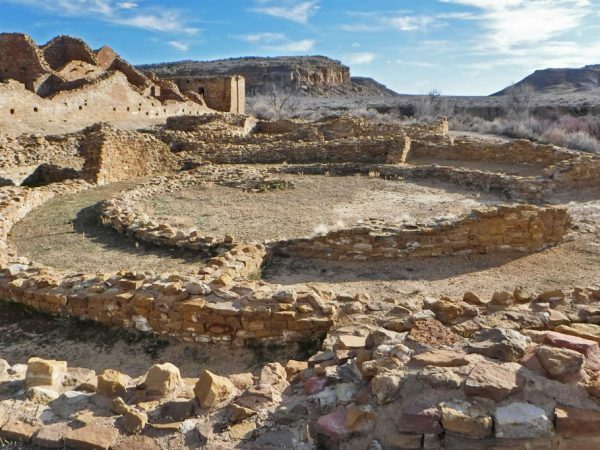 Why was the whole complex abandoned, and allowed to return to the desert? What we can do is marvel at the feats of these people. And we can imagine. Imagine large tribes walking in long straight lines across the desert toward signal fires that can be seen for miles. Following the road as it climbs over obstacles. Entering courtyards full of people arguing over the prices of goods in different languages. Watching dancers in colorful costumes move to the heavy beat of drums echoing off the canyon walls. Bearing witness to inter-tribal weddings and peace ceremonies. We can be sure these people saw the birth of the Crab Nebula in July of 1054 CE. The light from the supernova of its progenitor star had finally reached the Earth, and was easily visible to all watchers of the night sky. (Scientists are still studying the nebula today. The matter that makes up a star the size of ten suns just isn’t there. Where did it all go?) Also, Halley’s Comet, which made four appearances while Chaco was occupied, must have been observed. Near the Peñasco Blanco great house there is a rock painting under an overhang. 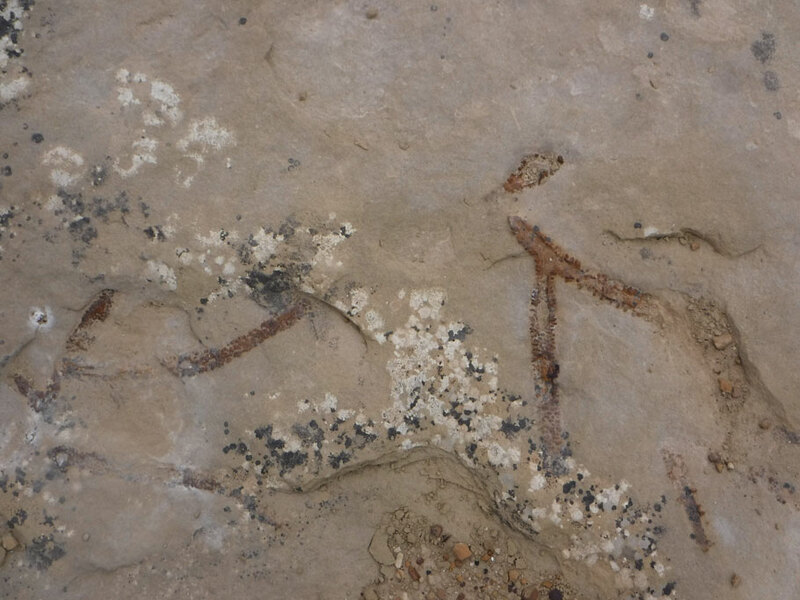 A hand, a crescent moon-like shape, and a star shape are painted on rock. A round shape with a long “tail” is painted on the ground below. Are these representations of the 1054 supernova and the appearances of Halley’s Comet in the years 912, 989, 1066 and 1145? We may find that missing supernova matter before we know the answer. 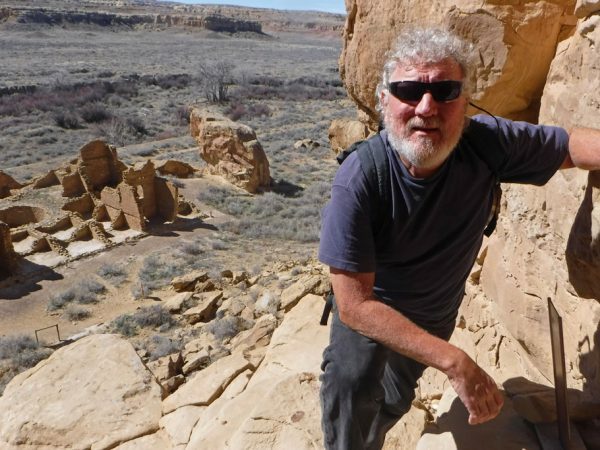 Gully crosses the northen road into Chaco Canyon. 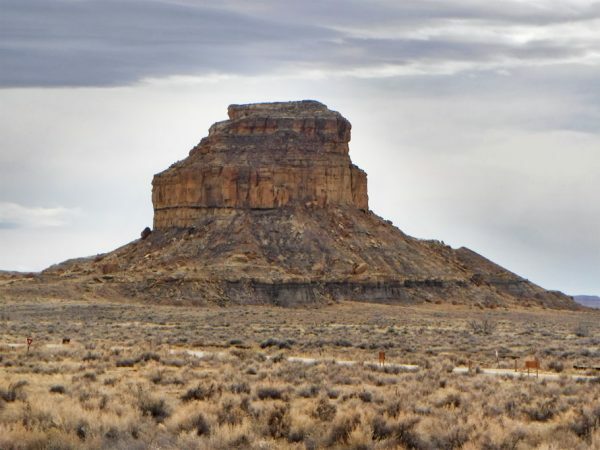 Fajada Butte. On the lower right side, the remnants of a Chacoan ramp still remain. 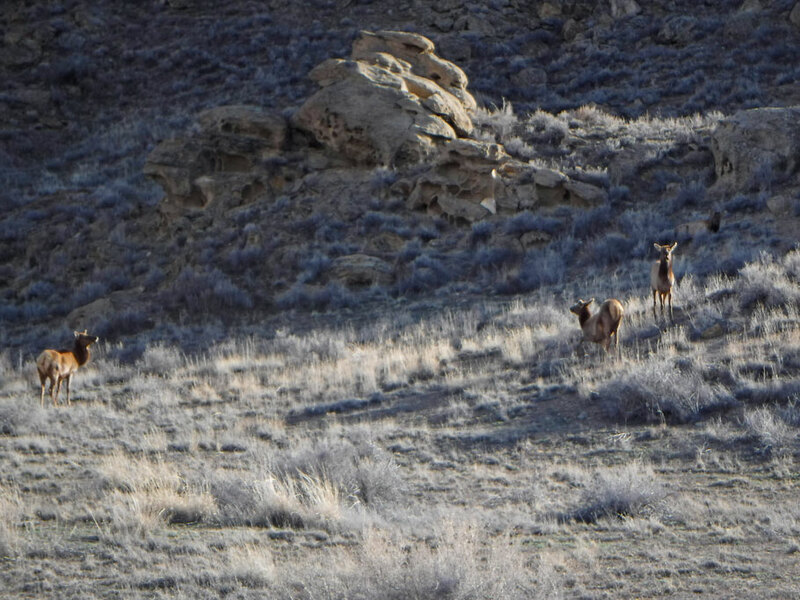 Petroglyphs at the top of the butte mark the sun’s rays at the change of seasons. Pueblo Bonito was four stories high and had over 650 rooms. The oldest and largest great house, it was built and modified between 850 CE and 1250 CE. 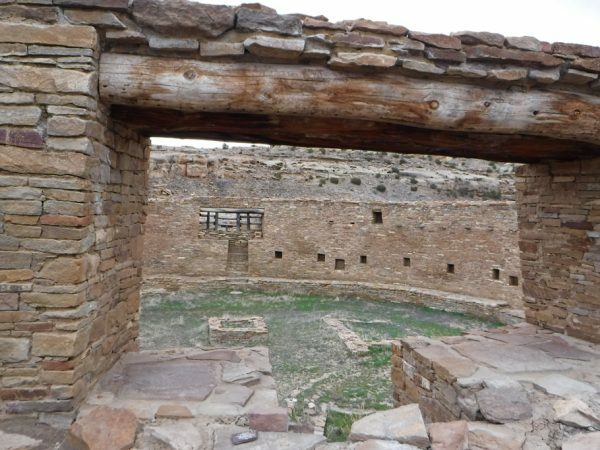 Facing back into Pueblo Bonito from the large courtyard. Canyon cliffs are in the background. 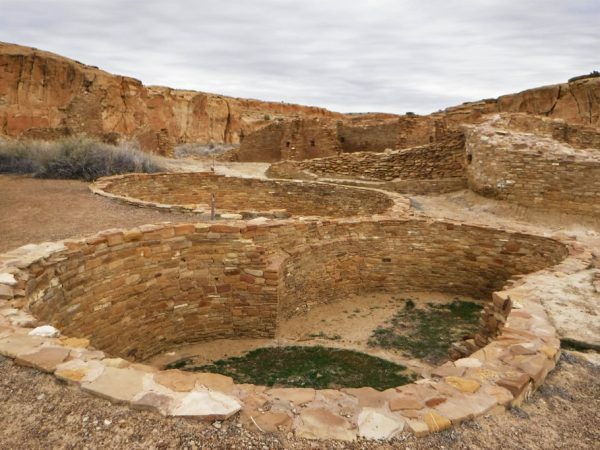 Great kiva in the courtyard. 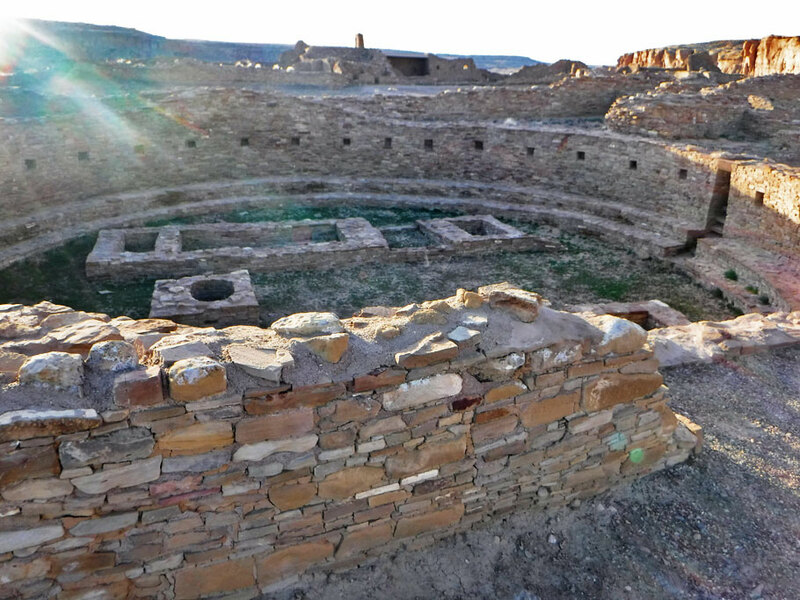 Kivas were round structures used for ceremonies. 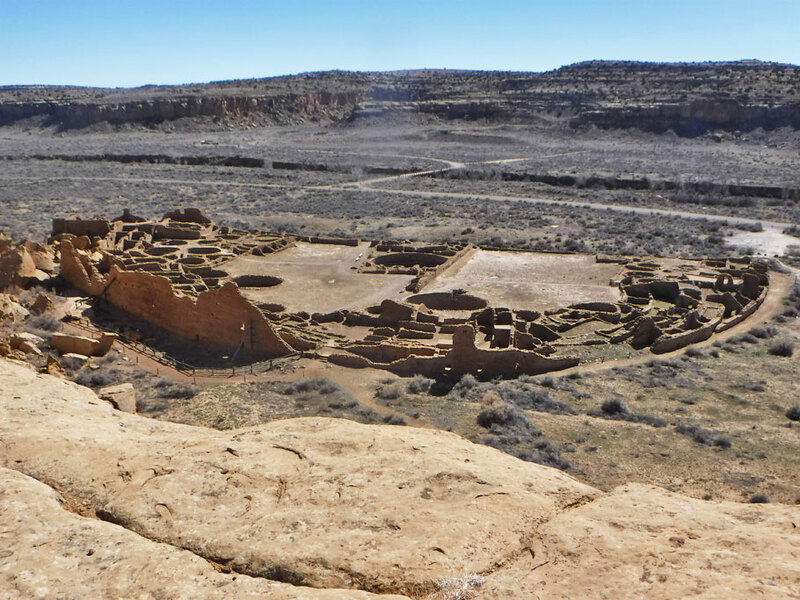 As in most southwestern kivas, there is a low bench around the base, firebox, and angular pits where timbers were seated. 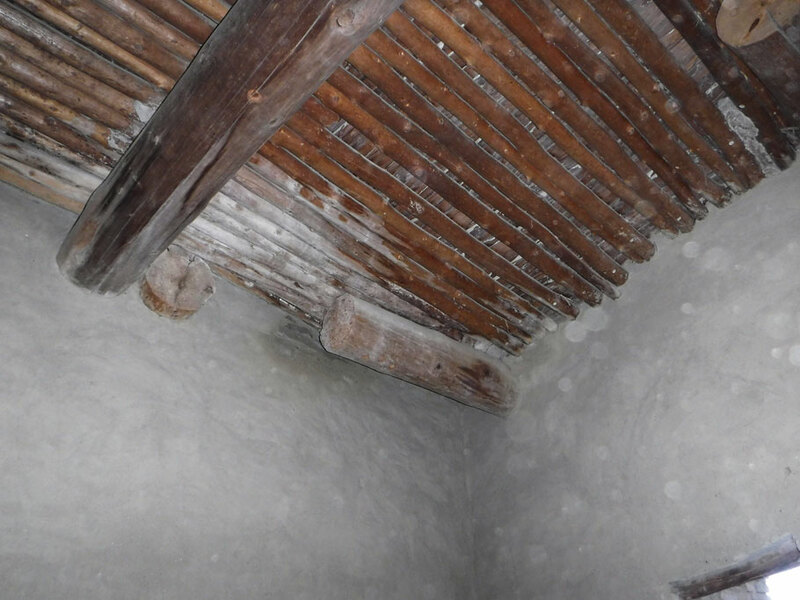 The timbers helped support the roof. Interior of the multi-level construction. 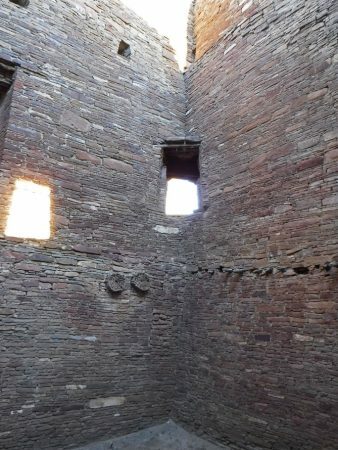 Doors were used for entry, but this corner was used to cast the sun’s rays, marking seasonal change. View through doors into rooms beyond. 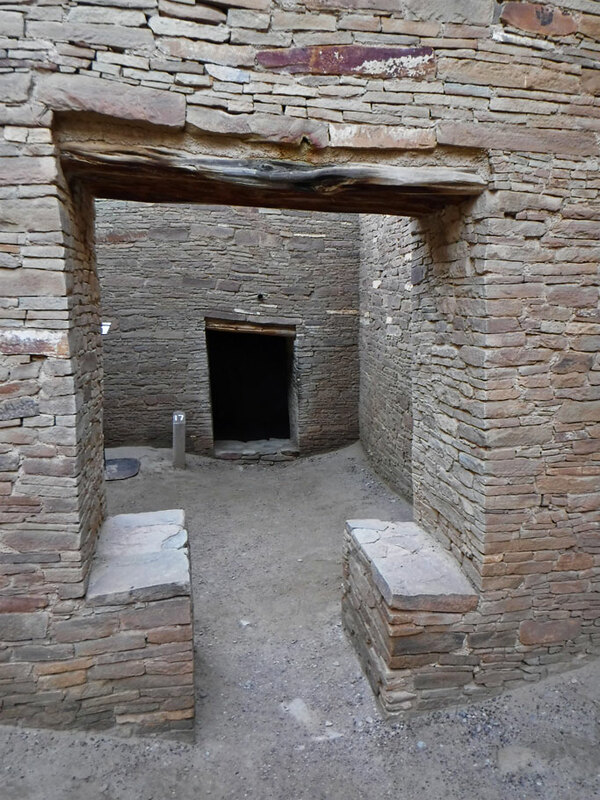 The T shaped door is found in many Pueblo structures. Between floors and at the roof large cross beams were used for support. These were covered crosswise with thinner timbers. 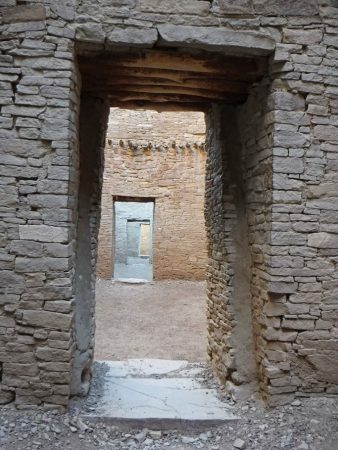 Construction here at the Una Vida great house started around the same time as the beginning of Pueblo Bonito. Very little excavation has been done here. Clse up of the old Type 1 construction. We’ll see the types change over time. 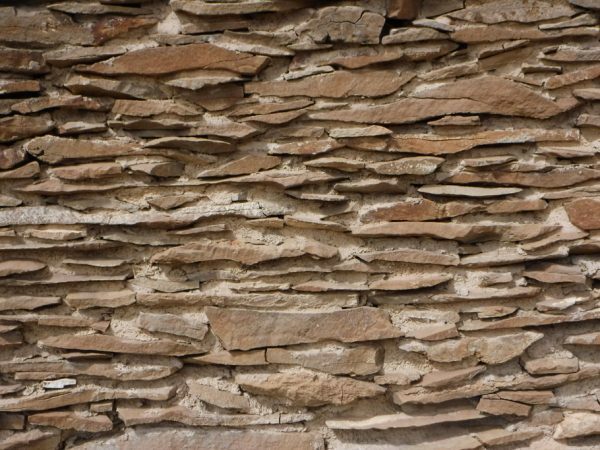 Here is a wall at the Hungo Pavi great house. Here at Hungo Pavi is an example of Chacoan roadway. These steps go straight up the side of the cliff. The courtyard at Chetro Ketl great house with canyon cliffs in the backgroup. Construction here started just after 1000 CE. 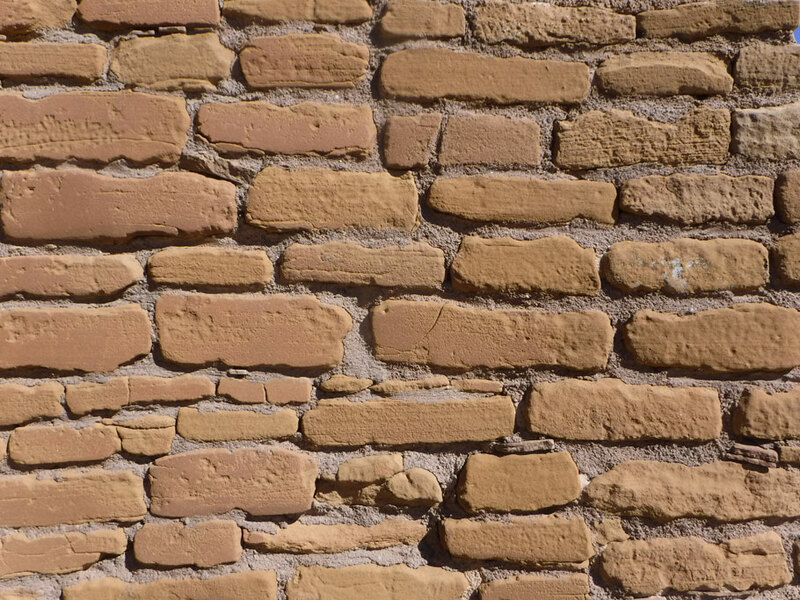 The layout has the same large walled D shape as Pueblo Bonito. 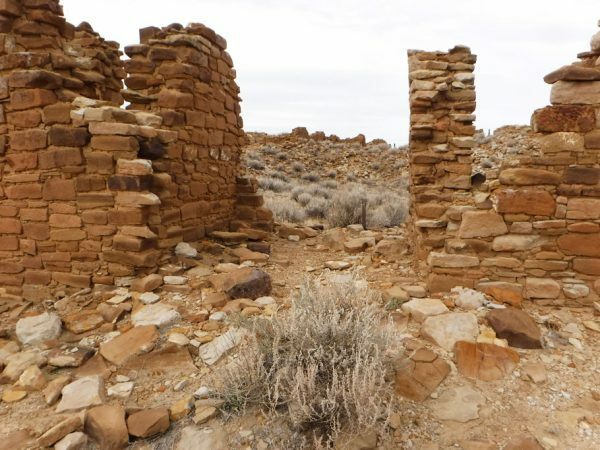 Kiva at Chetro Ketl. The sandstone discs in the upper left were layered between adobe inside the pit that they now surround. Underneath them was a suede bag containing powdered turquoise. More kivas at Chetro Ketl. On the “trail” to Pueblo Alto. 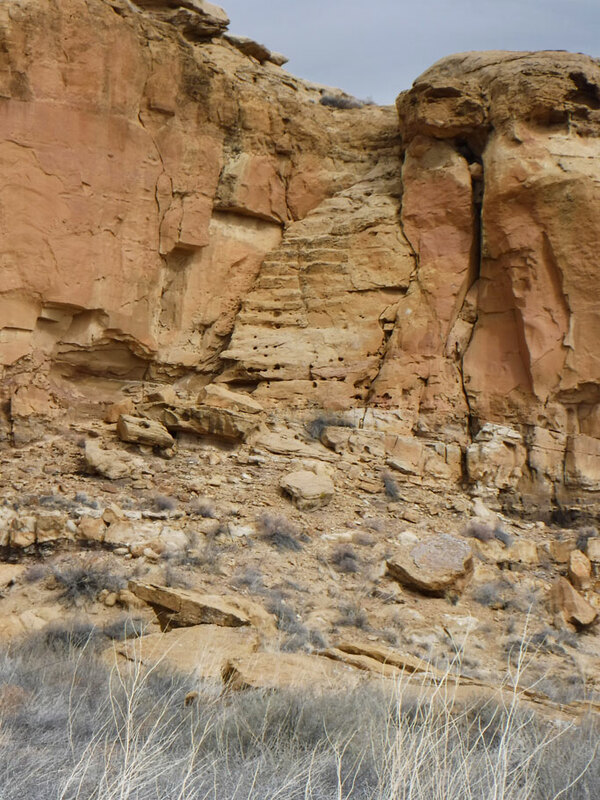 Atop the side of the canyon on the way to Pueblo Alto. We can see to the other side. Signals fires could be seen from one great house to the next. 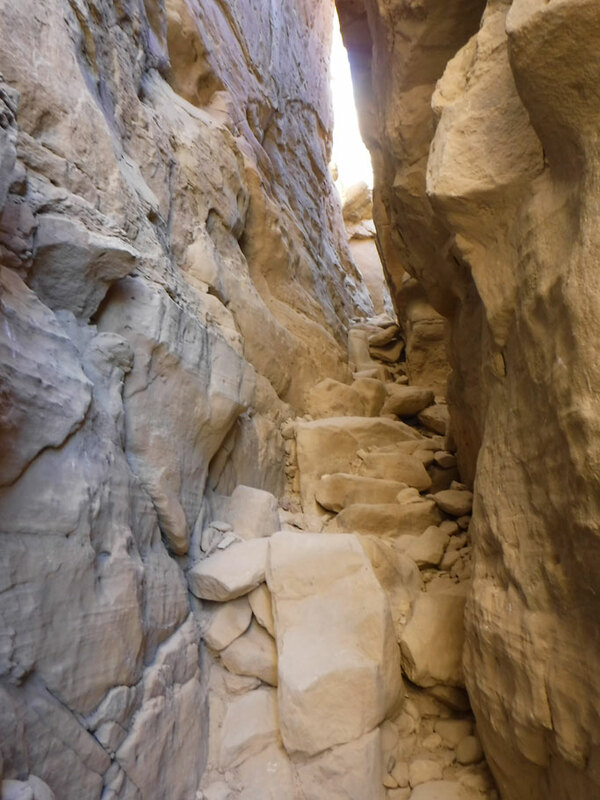 Within the canyon walls music may have echoed as well. 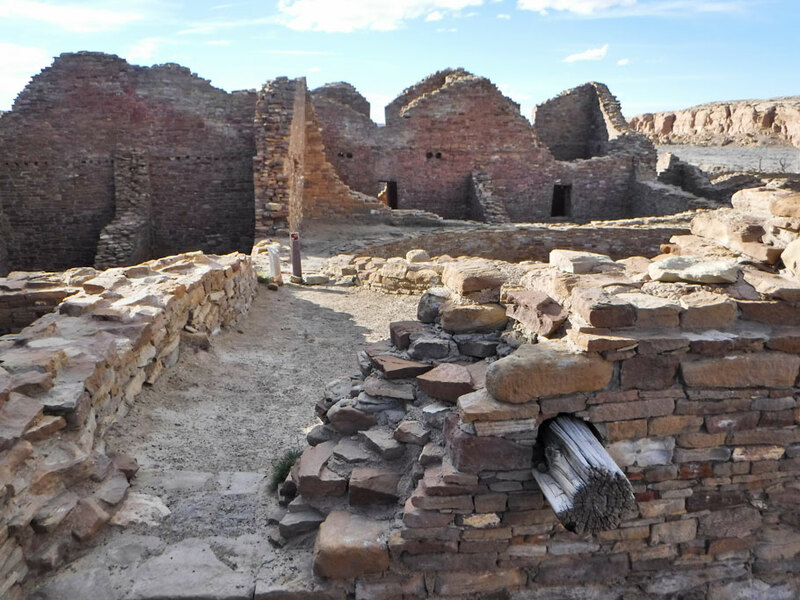 Traveling from one house to the next must have been a big part of experienceing Chaco culture. With the Type 3 style there is still a mixture, but with more distinct layers of large and small. By the Type 4 years they must have gotten tired of fooling with all the tiny stones. 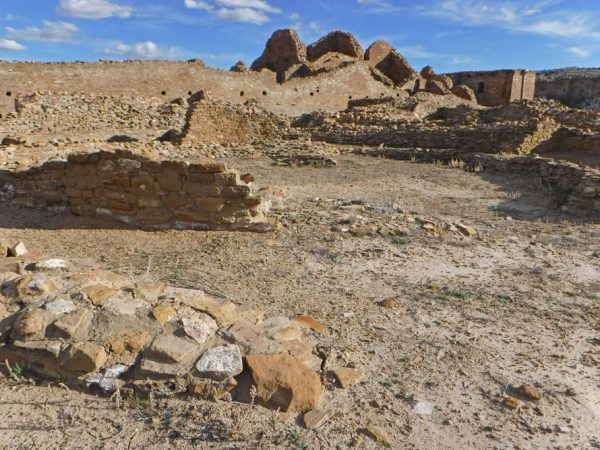 Pueblo del Arroyo was started about 1025 CE. It was built near running water, which is working to undermine the structure now. Ruins at Pueblo del Arroyo. 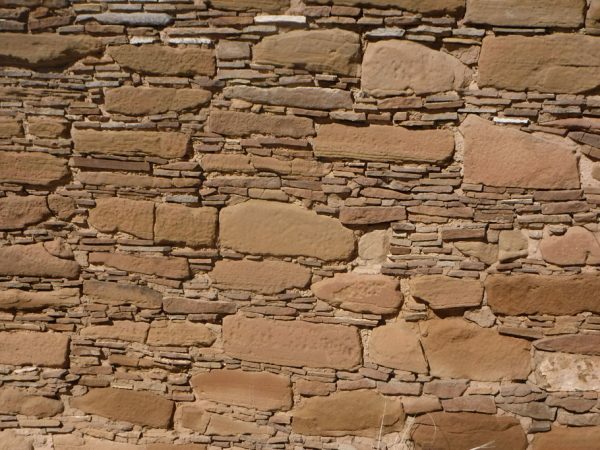 Curious tri-wall kiva structure at Pueblo del Arroyo. Kiva with large antechamber at Pueblo del Arroyo. Walled rooms at Pueblo del Arroyo. 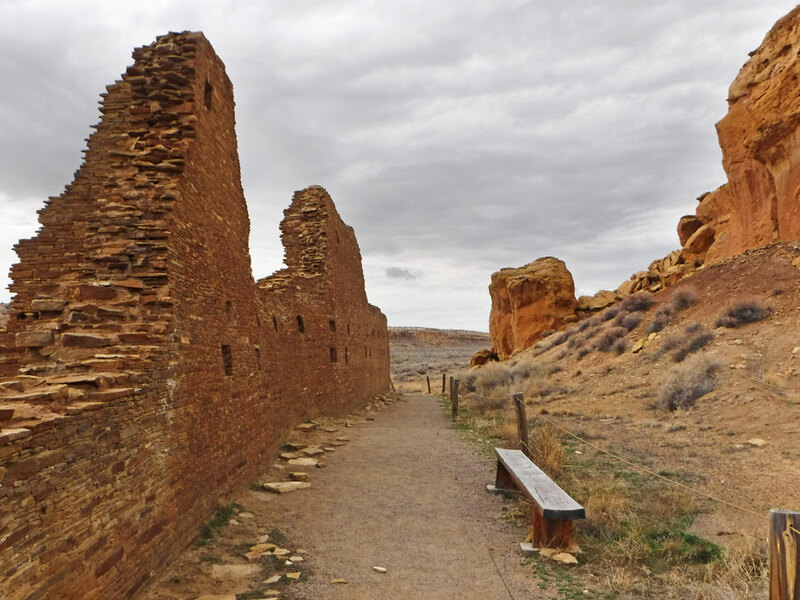 Panorama of Pueblo del Arroyo structures. 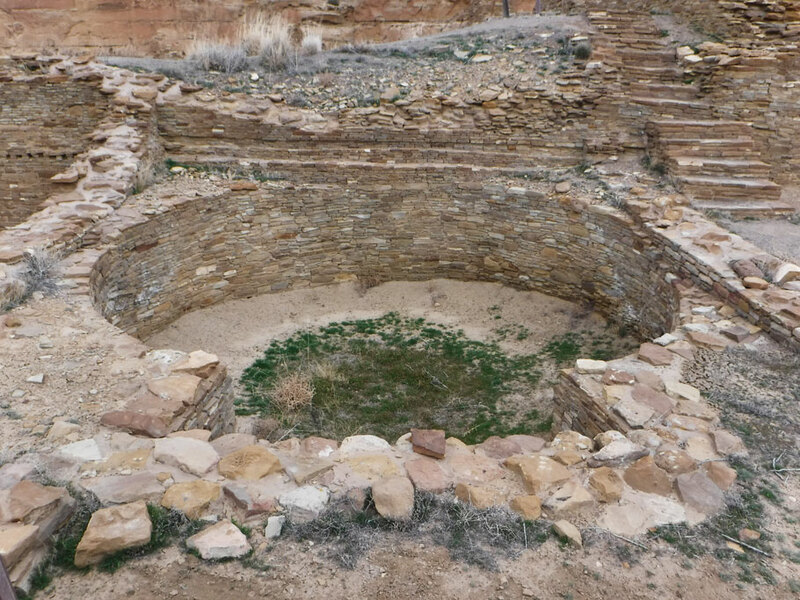 Large kiva at Casa Rinconada. Looking through T shaped doorway into Casa Rinconada’s kiva. 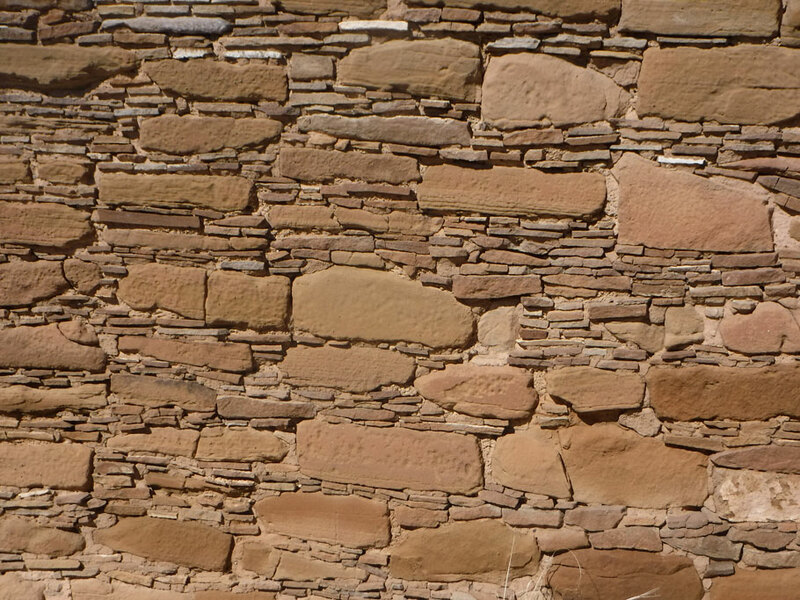 The ruins at the Tsin Kletzin great house show the later McElmo style of building using large stones with little mortar. Kin Kletso great house was started after 1100 CE. It lacks the large D shape and courtyard of the earlier efforts. The kivas are small. Large bricks were used in the construction. 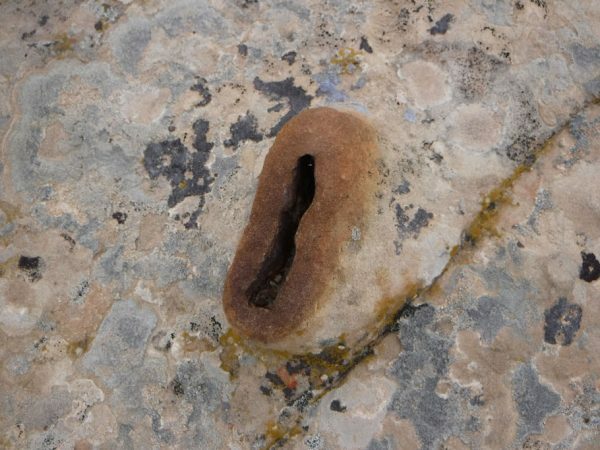 Shrip bore in the stone at Chaco. 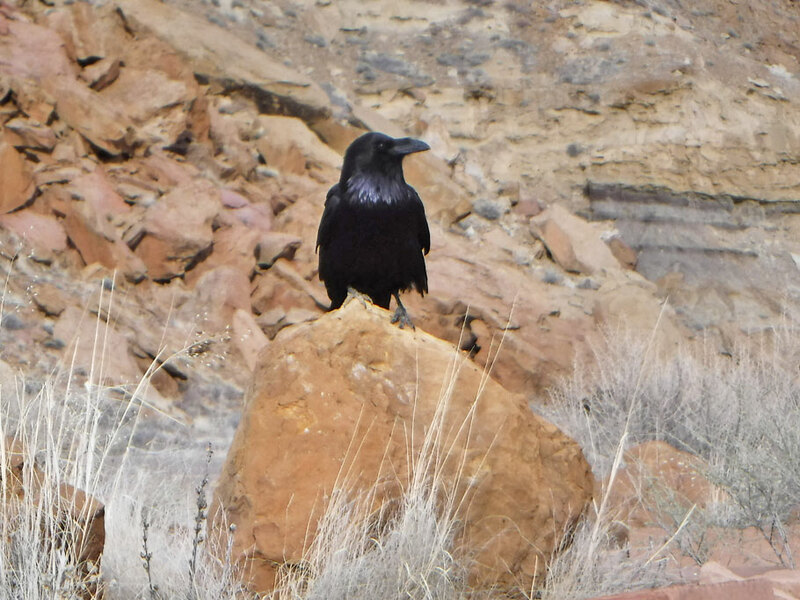 These can be seen on the cliff tops. When this land was all under sea level, shrimp bored into the sediment. The holes were eventually filled with non-sedimentary minerals. The land has been pushed up now, exposing the bores. More dark colored shrimp bore trails in the sandstone. 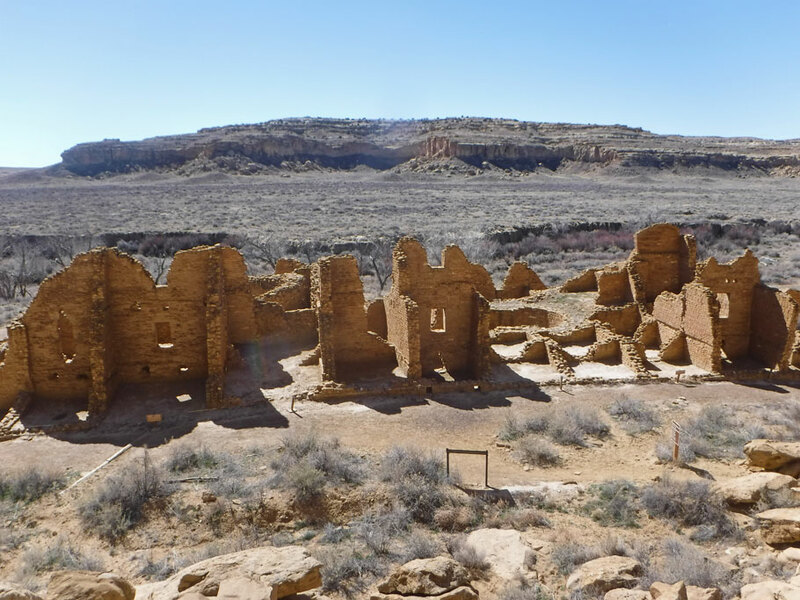 This entry was posted in National Park Service, New Mexico, Travel On The Dirt and tagged Chaco Canyon, National Park, Native American Ruins, New Mexico, NPS, Ruins. Bookmark the permalink. Fuhgoddaboudit Friday – love the idea! I wish I had started blogging ages ago as there are so many adventures that aren’t documented which I’ve pretty much forgotten now. Yeah – they go by so fast sometimes, you just have to slow down and remember.